No matter how carefully we live our lives, it is inevitable that beverages get spilled, grease and oil get tracked in from outside, and our carpeting shows every bit of it. While some stains can be removed with a DIY approach, many others cannot. That’s because it’s difficult with a DIY method to go beyond the surface of the carpet. Carpet fibers, however, quickly absorb spills and stains, making them hard to reach and very difficult to remove completely. That’s where professional carpet cleaning comes in! At OxiGreen in Bensalem, PA, we have certified and highly trained carpet cleaning technicians who have experience removing a wide variety of stains from a wide variety of carpet materials. At OxiGreen, we combine our stain removal know-how with our great carpet cleaning process to get you the cleanest possible carpets. Our modern, truck mounted carpet cleaning machines are among the best in the business. Our process dislodges the dirt, bacteria, dust mites, and other allergens caught deep in the fibers of your carpets. Our water extraction process removes this debris right along with 98% of the water, cutting the drying time for many carpets down to a single hour. No need to disrupt your family routine for an entire day. For professional stain removal and excellent carpet cleaning, contact OxiGreen in Bensalem, PA today at 215-269-3331. Along with removing the stains, we will restore the matted traffic lanes and have your carpeting looking great again. 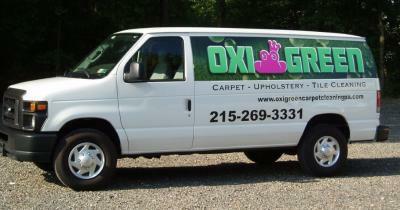 OxiGreen in Bensalem, PA is a locally owned company, so we think of you as our neighbor. We want you to be happy with our service, so we are pleased to offer a 100% customer satisfaction guarantee. If any stains appear in your carpeting within 14 days of our professional cleaning, we will come back and remove them for free, no questions asked.